Yellowfin BI is top-ranked for Embedded BI and Operational BI and recommended by 100% of surveyed end users in The BI Survey 18 by BARC. Ketchum, Idaho Nov 28, 2018 - Yellowfin BI, a world-leading business intelligence (BI) and analytics vendor, has received top rankings for Embedded BI and Operational BI in The BI Survey 18 by BARC and is also recommended by 100% of Yellowfin’s end users. This recognition in the world’s largest and most comprehensive survey of business intelligence platform end users shows Yellowfin’s continued leadership in the industry. This is the fifth year in a row that Yellowfin is top-ranked or leading for Operational BI in The BI Survey, demonstrating their consistency in delivering business intelligence that solves real customer problems. Alongside their two top rankings and 100% recommendation rate, Yellowfin was also declared a leader in 21 other categories across four different peer groups, including innovation, product satisfaction, ease of use, price-to-value, and data volume. In addition, 78% of surveyed users chose Yellowfin because of its price-to-performance ratio, which vastly exceeds the 38% average for all BI tools. BARC is an enterprise software industry analyst delivering product evaluations, conferences, market research and consulting to over 1,000 customers each year. BARC forms part of the teknowlogy Group – the leading European IT research and consulting firm with 150 staff in eight countries. The BI Survey 18 is based on findings from the world‘s largest and most comprehensive survey of business intelligence end users, conducted from March to June 2018. 3,045 people responded to the survey with 2,569 answering detailed questions about their use of a named product. Altogether, 36 products (or groups of products) are analyzed in detail using user feedback on product selection and usage across 30 criteria (KPIs). For more information on the survey, visit The BI Survey website. 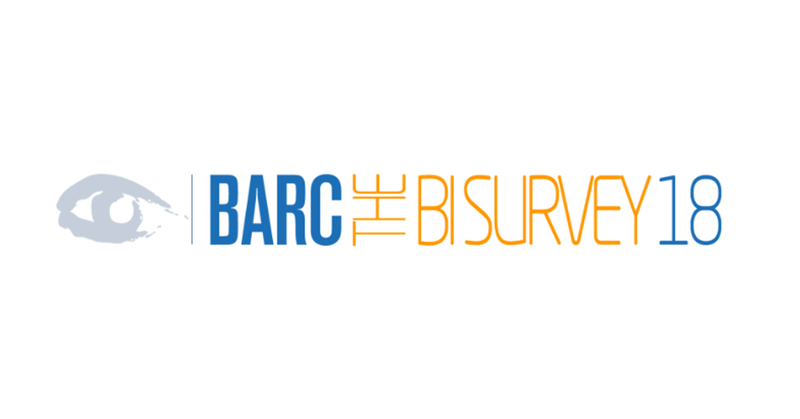 The BI Survey 18 features a range of types of BI tools so BARC uses Peer Groups to help identify competing products to allow fair and useful comparisons. The Peer Groups are segmented based on two key factors: the usage scenario and the regional focus.